Involuntary Smiles: I Am So Loved! I don't really like posting awards on my blog... it really has nothing to do with my life other than the fact that it makes me feel loved and happy. I have received several awards and suppose it is time to pass them on. I really don't like all the rules about "you must pass this on to x amount of people by sundown or you will forfeit your award rights and all your worst nightmares will come true" and what not. So, as always, with my awards, I think you are all fantastic people, and anyone who comments can grab the award. 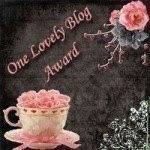 Since I was asked the question on how to get the award so you could post it on your blog, just right click on the picture, save it to your computer, and then post it as a picture on your blog. Easy peasy. Thanks to everyone who loves me and sent the love my way. Again, you are all my best friend in the world, and I want to be just like all of you. Valentine one of the minds behind Letters From Valentine gave me two awards. 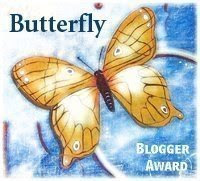 I received the Butterfly award today, and a while back she also gave me the Lovely Blog award. Again, if you want one of the awards (or even all of them) just leave a comment. See, I think if you leave me a comment it means you are wonderful, full of fun, and have a lovely blog. Take it and know that you are loved! And just because I am giving these awards out like they are going out of style, it doesn't lessen their value, nor does it mean they are generic. It means you all have really great taste! Well, I don't know how other people feel but I don't feel like I can just take the award without it being given to me specifically. It's just different.